It’s like no other facial that you’ve ever experienced as it’s a clinically proven treatment that is designed to work in the skin, rather than just on the skin to produce instantly visible results that last. HydraFacialMD is designed to provide instantly visible results after every treatment, alongside improvement in the health of your skin, giving you a complexion that you’ll love. Suitable for men and women of any age, skin colour, or type (oily or dry/sensitive). This seriously special facial leaves skin super hydrated, plumped and glowing not just improving its appearance, but it’s actually restoring youthful, healthy skin. This is why the HydraFacialMD is so important – not only does it remove surface damage such as dead skin cells and impurities, but it also replenishes the skin with antioxidants through Vortex-Fusion®, the most advanced application of nutrients to the skin. 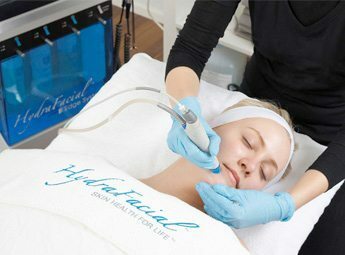 HydraFacialMD is performed using a vacuum based exfoliation tip that is loaded with a cocktail of serums, including antioxidants and hyaluronic acid to hydrate the skin and combat skin issues. This is the only procedure that combines cleansing, exfoliation, extraction, hydration and antioxidant protection all in one. Each HydraFacialMD experience uses a series of HydroPeel® tips with a unique spiral design which creates a vortex effect to easily dislodge and remove impurities while simultaneously introducing hydrating skin solutions with potent active ingredients. Step 1. Cleansing and Exfoliation. Dead skin cells are removed to reveal healthy new skin. Step 2. Infusion of glycolic solution which helps to loosen impurities, blackheads and debris from pores without irritation. Step 3. Extractions. Painless, automated extractions use vortex suction to clean out pores and remove blackheads. Step 4. Hydration. Antioxidants and Hyaluronic Acid are infused to nourish and protect the skin. Step 5. Maintain. The HydraFacial Daily Essentials help maintain, prolong and enhance results between treatments. HydraFacial Skin Solutions and treatment tips are clinically formulated to target specific skin conditions providing instantly visible results whilst gradually improving the health and quality of your skin. Your Skin health therapist will tailor the treatment to address specific concerns which may include general signs of ageing, pigmentation, texture, tone and acne. HOW LONG DOES THE HYDRAFACIAL MD® TREATMENT TAKE? On your first visit in Amara you will have a full Skin consultation as part of your treatment and can expect your full treatment to take from 1 hour to 90 minutes. The treatment itself generally takes on average 40 minutes. ARE THERE DIFFERENT TYPES OF TREATMENTS? The HydraFacialMD® is tailored to every individual depending on what their skin needs. After your consultation your Skin Health Therapist will decide what steps will be of most benefit to your Skin Health. WHO IS SUITABLE FOR THE HYDRAFACIAL MD® TREATMENT?